This stylish and large pair of vintage gilt-metal “cattail” sconces, from France, are virtually as weightless as cast light! The gilt-metal will provide extra illumination and ambiance with the light they reflect. UL approved wiring for the US. A fabulous pair of French vintage gilt-brass “laurel leaf” single-arm sconces, circa 1970s, each light fashioned to appear as if sitting upon a melted candlestick. A fabulous pair of French vintage gilt-brass “laurel leaf” two-light sconces, circa 1970s, each light fashioned to appear as if sitting upon a melted candlestick. 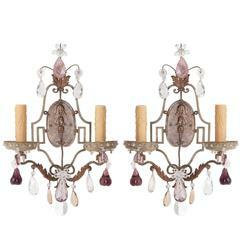 A pair of five-light vintage Italian gilt metal sconces with crystals. Each light with glass bobeche with drop crystals. Pair of 1920s French Baguès gilt metal sconces with two lights. Original patina. Measurements: 18.5" height 11.5" width 5.5" depth. A decorative vintage French wall sconce with 6 lights in gilded metal finish Please see close ups for finish Measures: 100 cm wide, 59cm tall. Pair of Maison Baguès gold leaf gilding carved and chiseled metal sconces. Flower model from the 1955-1960s. Perfect original condition.